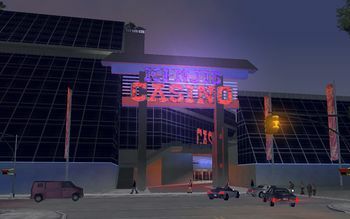 Kenji's Casino is a casino in Grand Theft Auto III, located in Torrington, Staunton Island, Liberty City. It is a Yakuza-controlled casino, named after the co-leader of the Yakuza, Kenji Kasen. Claude gets jobs from Kenji here in Grand Theft Auto III. There are rumors the police have an investment in the casino, but this was never proven. It took over from the Big Shot Casino sometime between 1998 and 2001. Although Kenji's Casino may be an interesting place, it is inaccessible, however, there is a hidden package on the rooftop helipad. In several pre-mission cutscenes, a garden area is seen on a roof of the casino and can be reached with the Dodo. One part of the garden is unsolid which will cause the player to fall through the floor into the building space. In Grand Theft Auto Advance, Kenji's Casino is located on the border of Hepburn Heights and the Red Light District in Portland. At the Torrington location is a casino-like building called Pachinko World. Aerial view of casino in GTA III. The general design of the casino's eastern face, as seen towards the west, GTA III. The casino's rooftop garden, GTA III. A helicopter in the heliport of the casino in GTA III. The Pachinko World in GTA Advance. Owner of the Pachinko World in GTA Advance. Teaser site for the casino, where it is referred to by its possible development name of Oicho-Kabu Casino. This page was last modified on 11 March 2017, at 15:12.